About two weeks ago I was on my way to meet my friend Ashley for lunch at a Thai place in Glendale. I arrived early and decided to walk around the neighborhood – and came across the most amazing used-book shop! Anyone who knows me knows that I can’t pass a bookstore without going in and getting lost for hours – so of course I decided to indulge myself. After browsing for awhile and almost purchasing an Eckhart Tolle book about “The Power of Now” (I was feeling a little depressed and kind of in a self-help mood), I decided to come to grips with my fear of jumping back into writing. It’s something I toy with occasionally, yet am afraid to take too seriously because I remember being in college and staring at my computer screen until 3am, begging my subconscious to spill forth the thoughts from my head in some form not entirely nonsensical. I usually just wrote bad poetry. But I have thoughts that are DYING to escape – and I long again for that world where I can encourage them to make their way out. So I pushed myself into the Writing section, startling another customer who was knee-deep into a book called “How to write a screenplay, and then cast yourself in the lead role” or something like that. 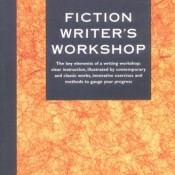 After seeing too many “How to sell your writing” books and becoming a little discouraged – I finally found “The Fiction Writer’s Workshop” – a book of exercises that one can do to exercise their creative brain. It was the perfect find – and I thought it would also be a great aid in encouraging me to blog on a more regular basis. So, starting this weekend, I am going to do at least one post a week that is a guided fiction writing exercise, followed by whatever writing I came up with while doing the exercise. And of course, I will try to write blogs about my life and current events from time to time as well. And I still owe Jade that blog about Costa Rica – and I still owe Ann-Sophie that blog about my experience in Fowler. I’m on it.